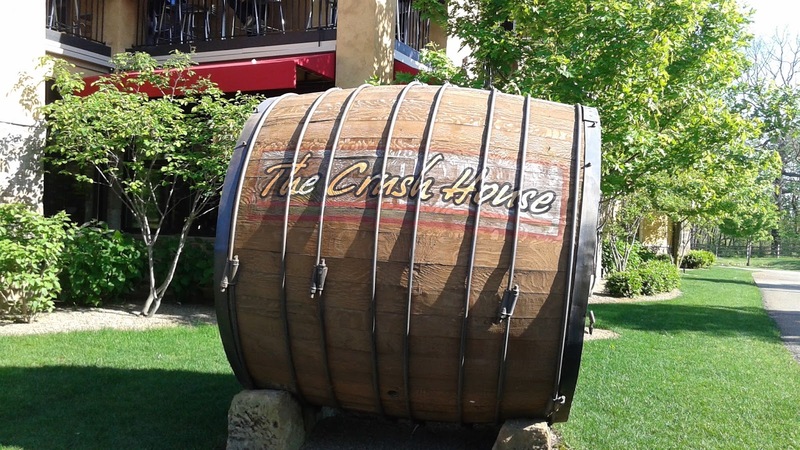 A few weeks ago a friend and I were lucky enough to snag two Groupons to The Crush House at Gervasi. Upon arrival we also found out that The Crush House has an extended Happy Hour on Thursday evenings until 8:00 p.m., so on top of the Groupon we also had access to discounted drinks and appetizers. A week after my first visit, I went back to The Crush House with Dave to celebrate his new job. Since the visits were so close in time, I decided to hold off on posting in order to share even more information with you. The Crush House is tucked in the back on the Gervasi Vineyard property and has multiple outdoor patio levels -- which is perfect for this time of year. Both times I arrived around 5:30 and was able to get a seat on the patio. The Crush House does not take reservations, but does call ahead seating starting at 5:00 p.m. nightly. 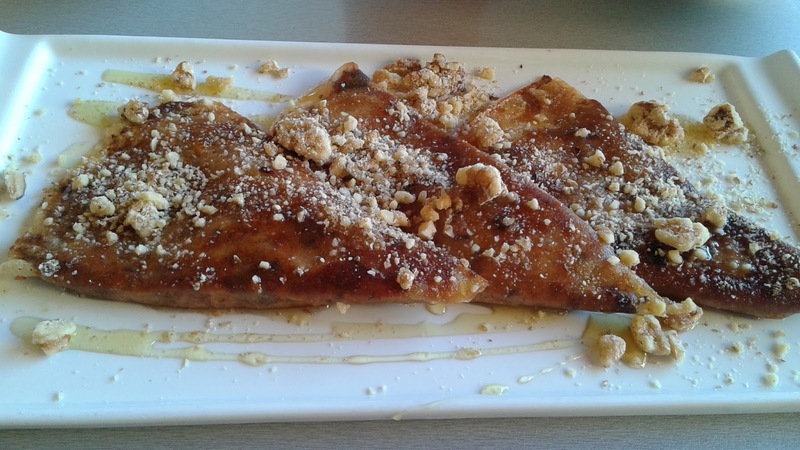 The Crispy Fig Crostatas -- made with "dried figs, cream cheese, roasted walnuts, clover honey", these are not one of the appetizers on the Happy Hour Menu, but they are really good. I would highly recommend ordering these for a light sweetness before your meal. Roasted Red Pepper Hummus (one of the $5 appetizers for Happy Hour) served with pita chips. The hummus was fresh and easy for us to split between four people. The New Old Fashioned, also $5 during happy hour. The Smoked Almond (another $5 Happy Hour Drink) made with whiskey, amaretto, orange juice, orange bitters, orange twist. I liked The Smoked Almond, but I usually prefer sweeter drinks, if you enjoy whiskey with a twist, you'd probably like this drink. I was torn between a few different meals for my dinner, but I ended up with the Housemade Goat Cheese Ravioli "goat cheese filled, eggplant "meatball," spinach, cherry tomatoes, marinara." 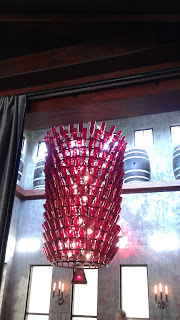 I love the eggplant meatballs served at the Gervasi restaurants, so I was happy one came with my meal. I intended to leave leftovers for Dave, but ended up eating all of this, whoops. Another friend ordered the Chicken Linguine with an added meatball "sauteed broccoli, roasted tomatoes, garlic cream." The Vegetariano Piada made with "eggplant "meatballs," arugula, fresh mozzarella, spicy diavalo sauce" was what I almost ordered. Those "eggplant meatballs" are seriously delicious, if you would prefer something over these menu options try ordering one on the side. The day that we went out we were celebrating two big job changes, so we splurged on dessert. The seasonal creme brulee that evening was caramel. I came back with Dave on a Tuesday, and we managed to squeeze in before the end of 6:00 happy hour prices that day. 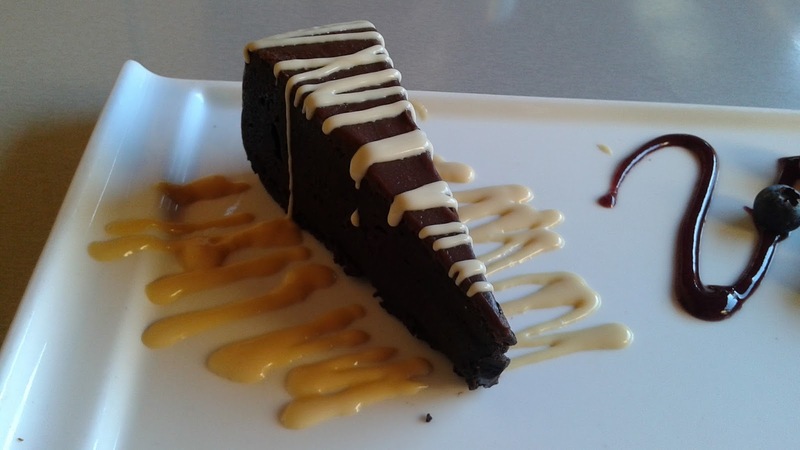 Our plan was just to celebrate, so we ordered several appetizers and then finished with desert. I ordered the Signature Crush House on both visits and it was the best drink that I ordered. This is such a pretty photo too. 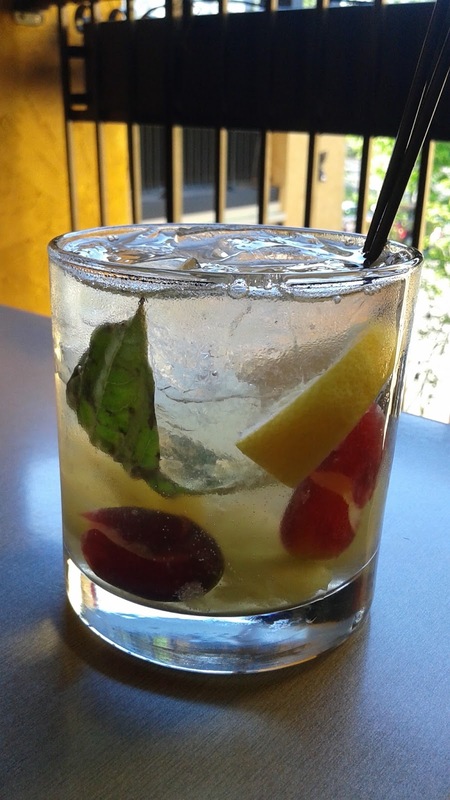 The Signature Crush House is made your "choice of gin or vodka, muddled grapes, lemon, basil, with a splash of ginger ale." 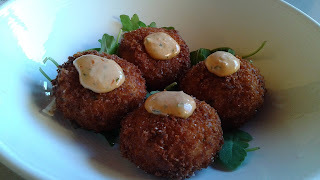 Also on the $5 appetizer menu were these Crispy Risotto Cakes served with arugula and sundried tomato pesto aioli. The Crispy Fig Crostadas again, I thought Dave would love them and he did! 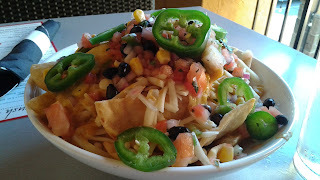 The last appetizer we split was the Loaded Pita Chips made with "corn, black bean salsa, white cheddar, jalapeno cream." This appetizer was also on the $5 Happy Hour menu and it was a nice summery appetizer. 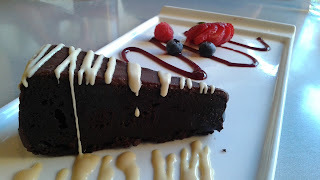 We finished off our meal with a slice of Flourless Chocolate Truffle Torte served with creme anglaise, and berry coulis. The Crush House at Gervasi is going to be one of our favorite patios to visit this summer. The Happy Hour specials are excellent, you can get plenty of food for a low price and having the extended Happy Hour on Thursday nights is great for people who work later in the evening. I was not disappointed with any aspect of my visit and I know that we'll be back. Next time I want to try one of the Affrogatos (drowned gelato) desserts.